If your Mac has been up and running awhile, no doubt you have accumulated lots of applications, whose launching icons may or may not adorn your Dock. If the latter is the case, your Dock has likely become pretty squished to the point where the icons are very small and harder to click. But, you ask, how can I get to my stuff without opening the Applications window? Among other things, you could make a ton of alias icons on your desktop and group them into related folders, or you could go the more elegant way of using Mac’s Launchpad. Launchpad is that rocket icon either on your dock or buried in your Applications folder. If it is not on your dock, open it and right-click on the icon and select “Keep in Dock” from the Options pop-up menu. 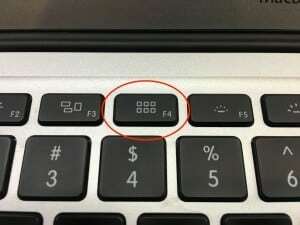 There is also a key on your keyboard devoted to the Launchpad. It’s on the F4 key and should look like two stacked rows of squares. Now left click on the Launchpad icon or press the key on your keyboard. Your display fills with at least one page of icons for applications and utilities presently installed on your Mac. This should look very familiar if you’ve used an iPhone or an iPad. See those dots on the bottom center of your screen? They indicate how many active pages of Launchpad icons you can access. To move an icon from page to page, hold down the left click and sweep your mouse cursor to the left. To open any application, just do a single left click on the icon. Group similar icons together. Now select one of the items, hold down the left click and place the item over another similar item. Let up on the mouse to create a group container. Change or add the name of your group–it’s up to you–by clicking on the group title at the top center after you open the group. You can move icons within the group or drag items back to the main Launchpad menu. Using Launchpad and grouping your application icons you’ll be able to get a better handle on managing your Mac. You’ll also be able to remove many of those infrequently used application icons from your Dock. One thing you cannot do in Launchpad, however, is delete an application icon. You actually have to remove the application from your Mac. To do this, you can go into the Applications folder in your Finder and drag the app to the Trash.